I prefer reading text and browsing the web on the bigger iPad, but in terms of actually holding the device the mini wins hands down. One iPad is better to look at and one is better to hold. It's a real problem. 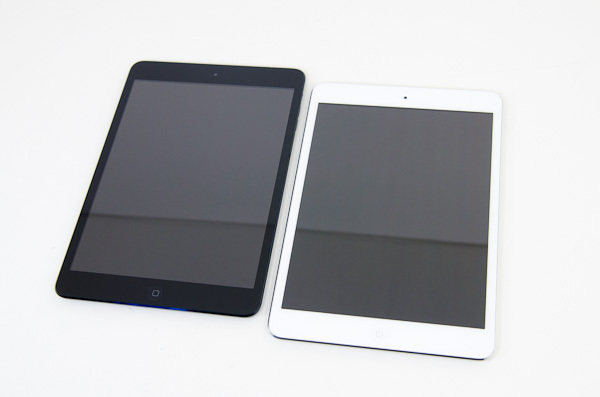 The obvious solution would be to give the iPad mini a Retina Display. Once again, in our Podcast on this topic, Brian offered poignant insight: a Retina Display likely won't come to the iPad mini. With the exception of the iPhone 5, Apple has preferred outright quadrupling of pixel count (2x in each dimension, option #1) to create a Retina Display. With the mini's display using a 1024 x 768 resolution, this option would give it a 7.85-inch 2048 x 1536 panel. That would be the same resolution as the iPad 3/4, but in a much smaller display giving it a pixel density of 326 PPI (vs ~263 for the iPad 3/4). Apple could do this, but it would then need to make all of the same changes it made in going to the iPad with Retina Display, primarily the introduction of a larger battery and much larger SoC. The bigger battery is needed to drive the more powerful backlight, and the X-series of SoCs is needed to actually render the UI and games at such a high resolution. Both of these things would increase the size and cost of the mini, which would make it distinctly un-mini. The second option would be to pick a new resolution that wasn't an integer multiple of the current one, say 1600 x 1200. You could maintain the same aspect ratio, but you'd just get greater pixel density. The problem with this approach is iOS for the iPad projects points in screen space to one of two resolutions: 1024 x 768 or 2048 x 1536. Picking a non-integer multiple of those resolutions would force Apple to do some scaling and filtering to hit the new resolution, which could reduce quality. Apple does this on the MacBook Pro with Retina Display to enable higher resolution modes. To maximize image quality however, Apple renders the desktop offscreen at 4x the resolution and then scales down to fit the panel. There are obvious performance concerns here as well. The final option would be for Apple to take the iPhone 5 route and just pick a new resolution and enable support for it. The only downside to this option is that developers would have to target yet another type of display. As we've seen with the iPhone 5, that can be done but it also means a number of applications may take a while to get updated, if they are at all. None of these options is particularly enticing for Apple, especially given the low (for Apple), starting price for the iPad mini. If you're expecting next year's mini to have a Retina Display, I wouldn't hold your breath. Since the current-gen ipad-retina-displays are pretty abysmal in terms of power usage (see displaymate's measurements for example), would it be unreasonable to expect LTPS or IGZO panels to make things considerably better? Apple uses Low-Temperature polysilicon IPS in iphone for a reason and it's said that the forthcoming IGZO's would help in power consumption as well. Firstly - the iPad 4 isn't a 'new iPad' as much as the iPad 3 was - it's an upgrade a partial way through the year, so it shouldn't be expected to address all 'the shortcomings'. Secondly - the iPad 4 doubles the GPU power which addresses the single biggest issue with the iPad 3 - the underpowered GPU. It's significantly faster than any other tablet (as is the iPad 3). Also known as the biggest ripoff apple has yet produced. Lightning connector (differently shaped usb 2.0), not-really-upgraded soc which brought nothing for the end user. Right? Because iOS is always super smooth? Or is it not? Wait wait wait and you're also saying that having even more unused gpu power is a shortcoming that was addressed? Well no point arguing with such logic. Especially since the cpu is already outdated. A9's (even with a custom memory controller) are so 2011. Alucard291 writes: "Lightning connector (differently shaped usb 2.0)"
I don't know about bias (I like to attribute ignorance over malice) but it seems particularly bad that not only is the N7 zoomed in compared to the Mini, but it's zoomed in so much that the N7's image is larger than the Mini's. because Anand's bias is showing. Still waiting for this rumored 'Anandtech' windows 8 review. But OMG look a small ipad, the site owner himself reviews. Our Win8 performance guide will be done this week. We're not doing a massive review (that would mostly be rehashing our significant DevPrev and ConPrev articles) will hit all the high points. I'm just disapponted that a site I've trusted and visted for years, is changing focus. if its an apple thing, there are tons of in depth reviews done right away, product, os, accessories etc etc. windows is now becoming the abandoned step child.